For several years now, I have been creating the constantly growing series of sculptures called Resurretion, which I use chiefly to take photos and make videos. It is an ironic, cynical review of topics related to biogenetic research and development. “An arrangement of sculptures complemented by people” is how I describe Relationships, a successfully growing series of photos started in 2011. The concept of the work is in a sense, to make these anthropomorphic sculptures, made from modified household appliances, machines and tools, appear to be as much like individuals as possible. Using them, I build changing scenarios that resemble suburban living rooms. 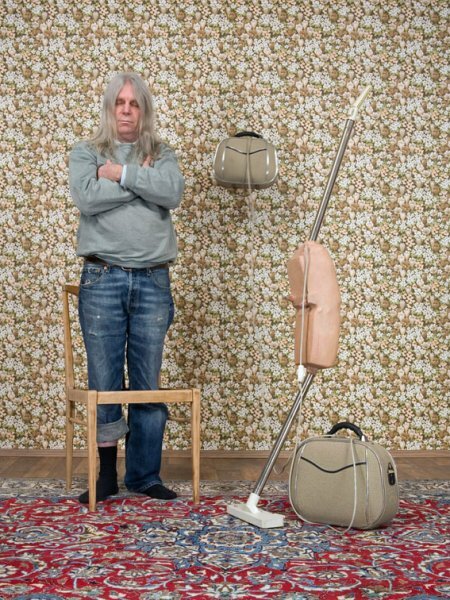 The pictures show men with their supposed mistresses, questioning relationships such as the male attitude towards daily housework. Born in Austria, Arnold Reinisch is a freelance artist of photography, sculpture, installation, video and painting. He has had exhibitions and participation in several countries such as Austria, France, Singapore, UK, and USA.